LONDON - This month Ferrero Rocher, the chocolate brand, is launching a £5m marketing push for its Christmas collections in attempt to gain a major slice of the seasonal confectionary market. The company, which is owned by Ferrero UK, which also owns brands including, Tic Tac mints, Nutella chocolate spread and Kinder Surprise chocolate, said the activity marks its strongest ever Christmas campaign and will be supported by a host of festive events. The campaign is designed to support its premium boxed range including the gifted assortment Ferrero Collection, as well as the newer additions, Ferrero Rondnoir and Raffaello by Ferrero. 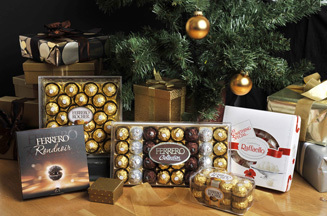 Ferrero said it wants to remind consumers that ‘Christmas isn't Christmas without Ferrero'. The campaign will run for the next three months, until Christmas Eve, and the company said it is aiming to reach over 16m consumers. National TV ads, by WCRS, will launch on 28 October. The company said the creative aims to position Ferrero as the perfect opportunity to ‘Share and Give Something Special' with friends and family this Christmas. TV ads will be supported by a seasonal campaign Christmas events at three of the UK's busiest shopping locations, Westfield in London, Trafford Centre in Manchester and the Bullring in Birmingham. The centrepiece in each location will be a towering Ferrero Rocher Christmas tree, made from 2,500 suspended golden baubles and measuring 15 metres in height. Ferrero will also be distributing 60,000 goodie bags across the three locations, including samples of the full Ferrero boxed range. Tucker added that some consumers have forgotten how good Ferrero products are. He said the Christmas trees and Christmas events were designed to fix this.